We have a range of customisable products including; Receipts, Receipt Holders, Key Fobs and Bedroom Bins. All with a choice of colours and lettering styles. 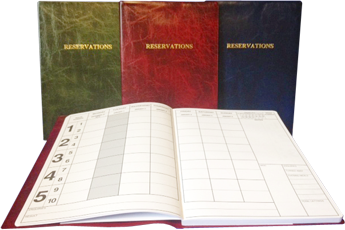 It is now possible to order Receipts, Reservation Diaries 2019 NOW REDUCED, Reservation Diaries 2020, Leather Effect Placemats, Guest Registration Packs / Cards, A4 Leather effect Menu / Wine List Covers, A5 Leather effect Menu / Wine List Covers, Bonded Leather Menu Boards, Wood Effect Menu Boards , Visitor Books and Guest Information Folders online using Paypal. For further information about ordering please see our How To Order page. Please Contact Us for further information or to source many other useful products by phoning (01904) 341 299.